colors blindness is decreasing the ability to differentiate between colors. It is mostly a genetic disease, but may have other causes related to problems in optic nerve. 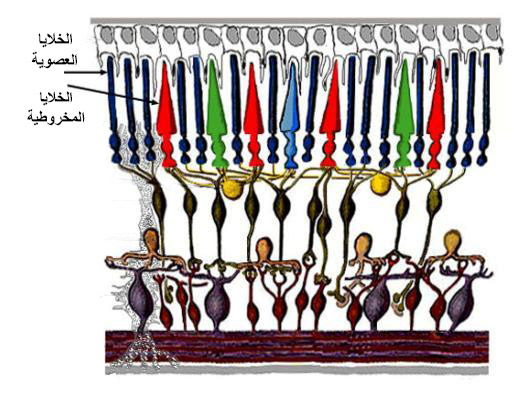 As we know, there are two kinds of photo-receptor cells in retina : The first is rods , which usually work in dim light and can not see colors. They see every thing as the tones of black & white. The other kind is the cones , which contain special materials that enable them to receive certain wave lengths of light. These cones are three types : Either sensitive to long waves (red) , or sensitive to moderate waves ( green) , or sensitive to short waves ( blue). By mixing the stimuli that come from these thee kinds of cones we can see different colors. Color blindness occur in males much more than females. While it occurs in 8 % of males, it is seen only in 0.4 % of females , so that means it occurs in males 20 times more than females. This is because it is X-linked chromosomal genetic disease This X-chromosome is single in males, so the contents of this chromosome are reflected outside easier that in females who have two X-chromosomes. Other than the genetic causes of color blindness, some optic nerve diseases may also create a difficulty in differentiating colors, as due to inflammations, trauma, drugs or toxic light rays that may damage the optic nerve, in addition to vascular obstruction of the blood vessels that supply optic nerve along with some age related diseases. There are many clinical forms of color blindness : In some rare cases where cones are completely absent, patient completely loses ability of seeing colors, and he/she sees everything as black & white. However in most genetic color blindness cases only one kind of cones is not present, either red or green or the blue one. Hence , as a result , patient ill either have problem in differentiating red-green colors , or difficulty in differentiating yellow-blue colors . 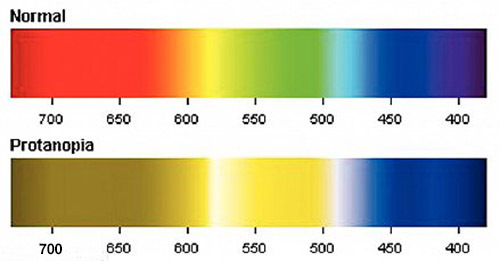 To be able to diagnose colors blindness there are many tests used for this purpose. 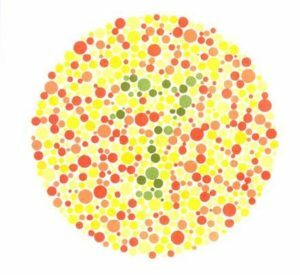 The most common one is Ishihara colors test, in which there are many pictures that contain mixture of different colors of spots with having a number in the middle, and patient is asked to recognize this number. The certain and complete treatment of color blindness is not present yet. However, there are some special contact lenses which are more sensitive to certain wave length light, that may help the patient to differentiate color much more.